18-YEAR-OLD hairdresser Maddi Lane is possibly one of the happiest business owners in town. "I think I just wanted to take on the role. So far it's been awesome," she said about her business which opened in July last year. "My parents have been so supportive," she said. The salon titled "Mad About Your Hair" located in at the Westside of Warwick is a dream come true for the young business owner. So enthusiastic about her career she couldn't point out a single negative of her job. "I like it all," said Maddi, who graduated from her apprenticeship which she began in 2010 only a month ago. Maddi who used to play with friend's hair from a young age said this is always something she wanted to do. "Hair is always the first thing you look at when you see someone on TV or up close. I guess we are trained that way," she said. "I'd eventually like to do a few different things," she said considering the future of her business. Maddi said the welcoming feel of her salon is what separates Mad About Your Hair from the pack. "I'd like it to be a salon where people feel like they're not a number, relaxed and with easy parking," she said. Step 4. Finish off with a touch of hair spray. This style can be worn casually or dressed up with a braid. 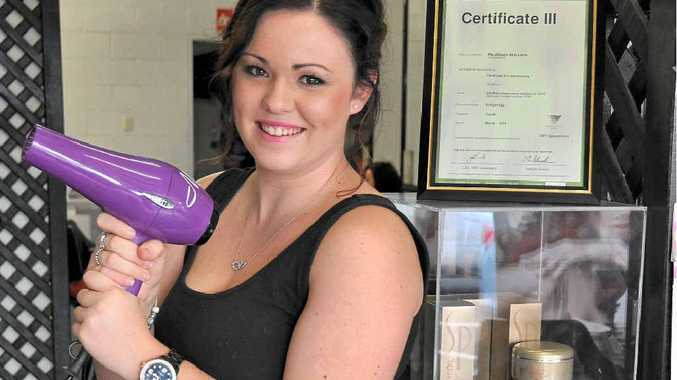 One of the only Wella suppliers in Warwick, the salon also does spray tans and hopes to have air brush makeup soon. "I love doing the really big style changes she said, constantly documenting her work. "If it's a big change I love to see the expressions on their faces and see how happy they are with the look," she said. As a very people-focused business Maddi feels personality is key. "You have to be friendly and easy going to survive this business," she said. However Maddi disagrees with old stereotypes. "Hairdressers aren't town gossips; people do open up to you sometimes but it not something that's repeated, it's more casual conversation," she said. According to the young hairdresser short cuts and styled bobs are on their way in this winter. Be careful when colouring your own hair as mistakes are often hard to reverse. Don't brush your hair when wet, use a thick-tooth comb.